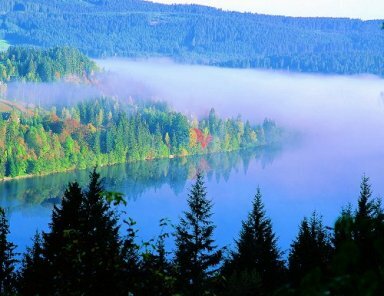 Discover Germany's scenic routes with your special designed driving tour. Germany offers many very interesting routes from the Alpin Road till the Westphalian Mills Route. Exploring the countryside between the big cities and you will be surprised by the change in scenery and by the many little villages which present quite a different image of Germany. 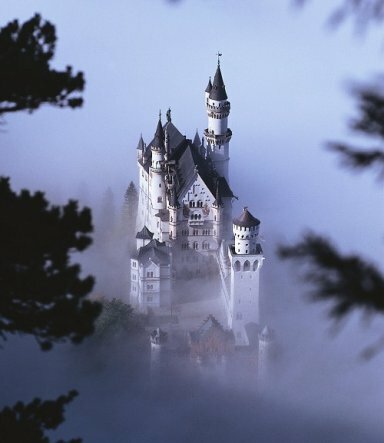 We will provide the best driving tours of Germany from the fairytale towns of the beautiful Midlands to the luxurious spa at Baden-Baden, from the galleries and theaters of Munich to the beer gardens of Bavaria. History enthusiasts will be fascinated by the German Limes Route. Handcrafted products such as porcelain, clocks and glass all have their own route, and regional products such as wine, cheese and asparagus also provide themes for culinary routes. Our tours includes "Must-see" sights and special-interest sightseeing, historic sites and natural history, scenic routes and recommended walks, special spots for children, and also restaurant recommendations. Get the most out of your driving tour with our special knowledge. Rivers play an important part in Germany, and the most prominent of all is the Rhine. Hilly woodlands and the lower-lying vineyards put their pleasant mark on the countryside. This is the centre of the Germany wine-growing area, and the famous labels of the distinctive Rhine and Mosel wines are internationally known. History has been made here since Roman times, but credit must be given to the Emperor Charlemagne who, in the 9th century, united the people of the former Roman provinces of Gaul and Germania and made Aachen the capital of the Holy Roman Empire. The region has special appeal for those who want to be active on their vacation. There is an abundance of walks for serious hikers on offer, all well mapped out. The constant flow of the rivers provides the backdrop for tours here and you may choose to become part of the busy river traffic, or just enjoy it from afar. There is always something new around every bend in the mountain roads. There is always something new around every bend in the mountain roads. Nature also plays a big part in this area of Germany, with many nature parks and wild deer roaming about the forests. The evenings are something to look forward to, sitting on the banks of the Rhine or Mosel rivers watching the world go by, trying a sample of the delicious local produce. Touring in this part of Germany promises to be both interesting and enjoyable. The North german plain covers a wide area from Holland in the west to Poland in the east. Many rivers and lakes provide attractive breaks in what otherwise would be an unexciting landscape.Proceeding from the south, the central region is covered by moorlands, which at some 20km from the coast give way to marshes. The North Sea tides raise and lower the normal water level by 2 to 3,5m, and high-sea shipping is possible both on the River Elbe and up to 100km from the North Sea coast and 70km up the River Weser. Dikes protect low-lying lands from flooding at high tides. 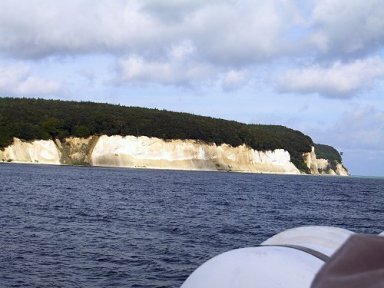 The Baltic Sea coast offers quite a different scene. Sand dunes form the coastal strips, up to 100m high, in some places even higher, and seaside resorts enjoying sandy beaches. Further south, Saxony and Thuringia are hill country, far removed from the effects of the northern seas. Extensive woodlands, mostly unspoilt by mass tourism, offer a relaxing atmosphere away from the big towns. South of the North German plain the map changes and from west to east a hilly and mountainous landscape emerges, cloaked with beautiful forests, lakes and rivers. One scenic route follows another, and as the mountains, with few exceptions, do not reach heights above 1.000m, there are the advantages of easier walks. Heading into the countryside from the towns and cities of the Ruhr, the visitor is pleasantly surprised by the change in scenery and by the many little villages which present quite a different image of Germany, a Germany for holidays and relaxation. 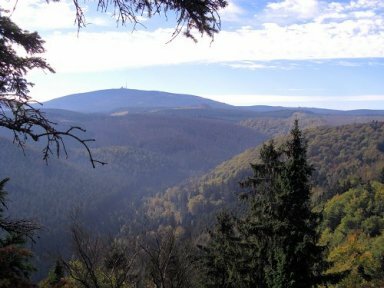 The Harz region is called "The Heart of Germany", and since unification, it is definitively more in the middle of the country than before, when it formed the border with the eastern provinces. The Harz Mountains were exploited for their valuable ore deposits from as early as the 10th century, with the trees above the mines providing the necessary fuel for the refining operations. Numerous forests, interrupted by the tributaries of the Weser, make this a very pleasant area to explore. 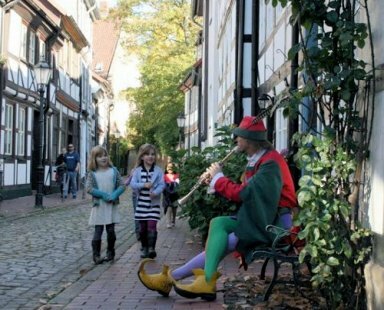 Nature parks compete with medieval towns for attention, and it is no wonder that the Deutsche Mächenstrasse (Germany Fairy Tale Road) runs right along the Weser and its riverside towns. The towns themselves often seem to have been plucked straight from the pages of a fairy tale. Further down, in the unspoilt northern regions of the province of Hessen, there is no geographical border, but visitors arriving from the north are greeted by three large nature parks to the west and east of Kassel, with the Reinhards Wald (forest) bordering the northern approach to Kassel itself. Historic towns full of fine buildings and surrounded by forests provide a balanced landscape between the city and nature. The Sauerland region consists of tree-covered hills, rivers and the massive dams which supply the mighty industries of the Ruhr valley to the west with water and power. Bavaria forms the southeastern part of Germany and is one of the largest and most important provinces. In the north is Franken (Franconia), which consists mainly of hilly countryside bordered by the ranges of the Thüringer and Böhmerwald mountain ranges. Further south is the fertile plains of Bavaria and its three main rivers: the Danube, the Isar and the Inn. Towards the Alps, a series of lakes stretches from west to east, before suddenly being confronted by those mighty mountains, with heights of nearly 3.000m. One of the most scenic road trip follows the Romantic Road from Würzburg to Füssen. can be very emotional, especially in the alpine regions. What can be more romantic than Christmas Eve in one of these Alpine villages, with plenty of snow about and the candlelit Christmas trees to be seen in the charming Bavarian houses? Baden-Württemberg stretches across south-west Germany with the Rhine forming a natural border to the west and the south where it joins the Bodensee (Lake Constance). Germany occupies by far the largest proportion of the lake shores, but this geographical advantage over neighbouring Switzerland and Austria does not upset the harmony of this relaxed lakeside community. Lake steamers ply from country to country and a great deal of co-operation exists between the partners whose commerce, language and history have so much in common. The Rhine flows past the southern reaches of the Black Forest region. Here it should be mentioned that the term "black" is something of a misnomer, as the forest is both brilliantly green and extremely beautiful. There seems to be a parallel here with the "Blue Danube" which rises near Donaueschingen. Traditional crafts such as clock-making and glass-blowing can still be seen in the Black Forest villages. The Deutsche Uhrenstrasse (German Clock Road) draws attention to the origins of the cuckoo clock deep in the heart of the forest. The area around Bodensee and the Black Forest Germany is not only spectacularly beautiful, but the woods and hills are well supplied with many enchanting small hotels and inns. So a Black Forest drive is a must when you travel to Germany! 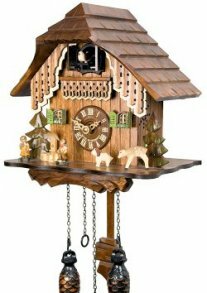 This cuckoo clock has a typical Black Forest house with a hand-carved shingled roof, children figurines with their dog, fir trees and a deer. The cuckoo calls on the hour according to the time and is followed by an echo and by one of 12 alternating melodies. A light sensor automatically turns off the cuckoo sound and the music at night, or they can be turned off anytime by means of a manual switch. The clock is personally signed at the back by the manufacturer Adolf Herr. His signature guarantees the experience of 6 generations of clock-workmanship. This clock comes with a certificate of authenticity (AHC). thanks for all your help in making the arrangements. Things ran very smoothly and this really helped us to relax on our holiday. When we decide to take another vacation like this, we will definitely by in touch! I just wanted to touch base with you and tell you how wonderful our trip was! We absolutely loved Germany and Austria! They are beautiful countries and the people were all very welcoming and helpful. We had no trouble at all with our driving ourselves and thought it was the best way to see everything. I just wanted to thank you for all of your services, everything was great! We would definitely recommend your services to any friends who may travel your way.